A town running out of burial space in its churchyard is hoping to set up a memorial website to encourage people to use a natural burial ground nearby. 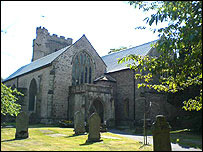 St Mary's Church in Usk, Monmouthshire is expected to run out of grave space within five years. A private cemetery in Usk castle grounds offers "green" burials but headstones and memorials are banned. Town officials hope an online memorial will allow relatives using it to leave tributes on the web instead. Town councillor Roger Galletley explained: "The existing church yard only has space for about four or five years. "The town council and Monmouthshire Council have been trying for the last seven years to find additional land within the town which could be used as a cemetery. "We did find one local landowner who wanted a quarter of a million for it which wasn't viable. "But there is a natural burial site," he said. 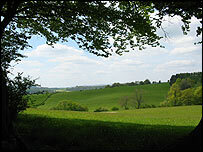 The site is in the grounds of 12th Century Usk Castle and can hold 2,500 graves. But none of the graves can be marked formally with headstones and the coffins must be made of biodegradable material. Burials at the site cost around £1,000. "It's a wonderful site with magnificent views over the Usk Vale but one of the conditions of natural burial site is there are no memorials," said Mr Galletley. He said he thought this was one of the reasons putting people in the town off the cemetery. Talks were held to erect a permanent memorial in the town which names could be added to instead of having individual memorials. However, the only place it could have been erected was in the church's graveyard and there were fears that only those who were of the Christian faith would be allowed to be included on the memorial. "We felt we needed a memorial that encompassed all faiths," explained Mr Galletley. "So we came up with the possibility of an online memorial website. "Instead of a stone memorial, you could have a page of your own which could have writing on similar to a headstone and which would be there forever." He said pictures of the burial plot or the views from the grave could be added to the memorial page which would be maintained either by Native Woodlands, who run the natural burial ground, or the town council. Mr Galletley said: "We've had no complaints to the idea, but it is still very much in its infancy at the moment." Web designer Alfie Goodrich, whose parents are buried at the burial ground, said a website would "fulfil a need" many grieving relatives have for a lasting tribute to loved ones. He said: "It's more accessible than a book and people can opt to leave more than basic listings. "It can be an ongoing tribute where people can add pictures and other things. "There is nothing at the burial ground to mark it as a cemetery and the website could also provide a record for Usk of who is buried there as the numbers increase."